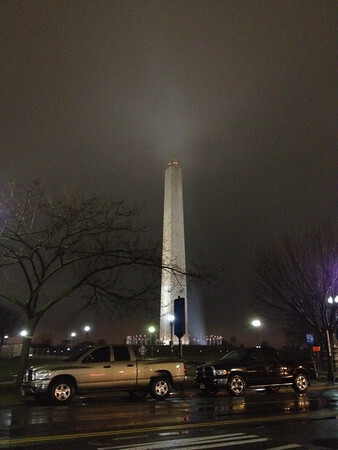 January 11, 2012 - Washington Monument. Snapped this on the way home from a Caps game. The weather was pretty much awful - only saving grace was the temperature was above freezing, so it wasn't snowing. Saw the monument in the fog and the rain as we stopped at a stoplight. Rolled down the window and grabbed a quick shot with my phone. CKB didn't even notice I'd done so, until she saw the picture online later. Photo Notes: ISO 800, 1/15th, f/2.4, handheld iPhone - no extra lenses. Critique: Basically a snapshot here. If I'd been carrying the big camera I might have stopped and gotten out to walk around to get a few more shots. Will have to keep this in mind for future rainy, murky nights with low hanging fog.